Always over-encumbered but don't know where your weight is coming from? 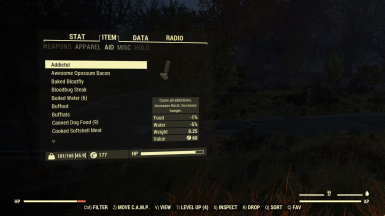 Dying of hunger/thirst because you can't find your food and drink items among all the other chems/Stimpaks/RadAway/bobbleheads in the Aid category? Jump two tabs at a time by holding the Shift key while navigating left and right. Jump directly to the first (Weapons) or last (Ammo) tab by holding the Shift key while navigating up and down. 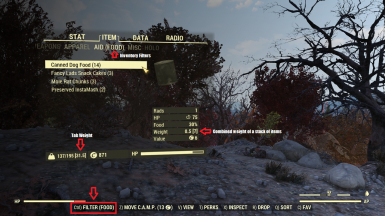 When in the Inventory page on your Pip-Boy, press Ctrl (or LB on a gamepad) to cycle through item filters. Press Alt to cycle backwards through filters. You can also click or scroll on the tab header to change filters. 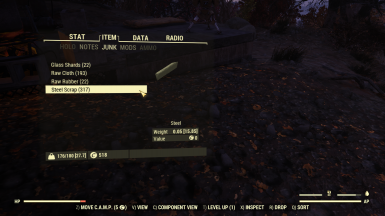 Then place the main file (BetterInventory.ba2) in your Fallout 76 Data folder and you're ready to go. 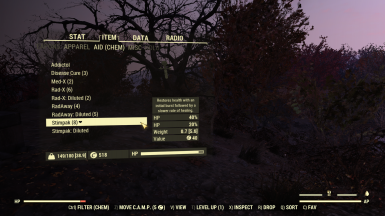 Otherwise, if you have an existing Fallout76Custom.ini, add the following lines to it. If you already have this line, append BetterInventory.ba2 to the end of the existing line. Entries are separated by a comma. 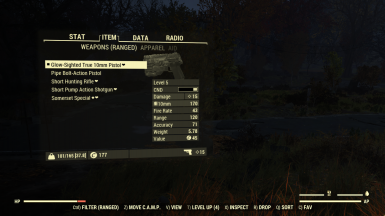 This mod modifies Pipboy_InvPage.swf and will not be compatible with other mods that do the same. 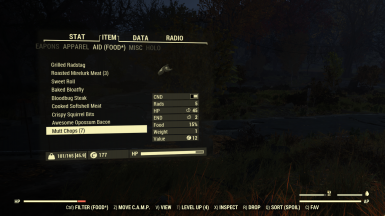 Pipboy_InvPage.swf is only very minimally modified to load the Better Inventory module - changes are made dynamically at runtime and the original interface file's logic is untouched. 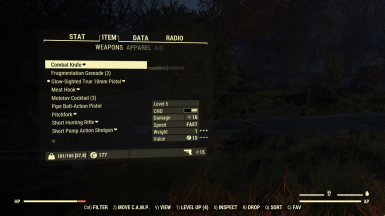 This keeps Better Inventory's code self-contained and separate from any specific version of the Pip-Boy inventory page. Should Bethesda update this particular file in the future, barring any major architectural changes, it would be minimal work to update the mod. This is an interface modification. 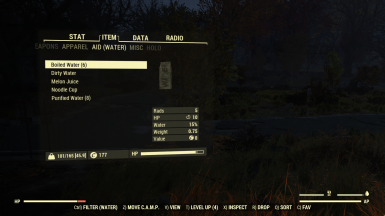 It does not use any hidden information that is not already available for you to view in the Pip-Boy. 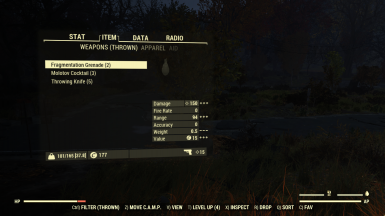 Nothing on the server is affected or changed in any way by this mod. This mod does not take any server-side interactions on your behalf. You must still equip weapons and consume food yourself.